Conversation Viewer is a free WordPress plugin to display chat conversations between people. Here it lets you display chats as they appear on social media applications like Facebook, WhatsApp, Snapchat, etc. To add chat on your site, you just have to add it using a simple shortcode. It lets you customize chat bubbles and you can opt for other options as well. The plugin is simple and open source as well. You can easily install it on your site and then add conversations like a pro. If you want to display conversations on your site in the same way they look in the popular apps then this plugin will help you. With the various chat styles and customizations, you can easily add conversations in your posts. The best part is that you can use this to create fake Facebook, WhatsApp conversations as well. However, it currently has some problems with the new Gutenberg editor of WordPress but that will be fixed soon. The conversations that it lets you create are responsive ones and look amazing. This is a very simple and a very straightforward plugin for WordPress that you can use. 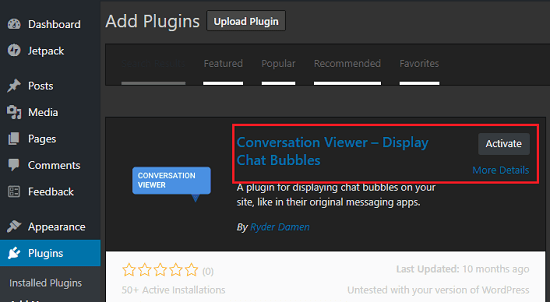 To install it, just search “Conversation Viewer” in the Plugins section of WordPress and then install it. Next, activate it and then simply start using it. To use this plugin to add chat in your website, you have to use shortcodes. And then define the conversation texts. You can see the following example of shortcode. You have to define messages in this way. 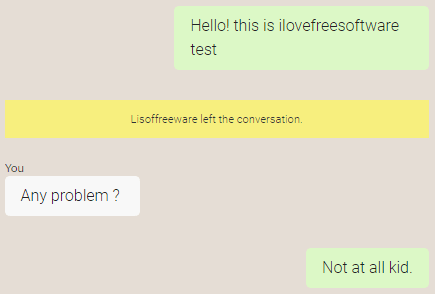 // Command: Lisoffreeware left the conversation. //You: Any problem ? //Me: Not at all kid. By default, the conversation style will be of Facebook Messenger. But you can change that. It supports conversation style of WhatsApp, iOS, Android, and Snapchat. You just have to define that using “style=” parameters. You can see then following screenshot and shortcode example. In this way, you can use this simple WordPress plugin to display chat conversations between people. You can use this handy plugin, Conversation Viewer very easily. Apart from just displaying the conversations, you can customize a few parameters as well. And for that you can see its GitHub page for more details. Conversation Viewer is a very nice WordPress plugin to display chat between two people. And I really like the appearance of the chat bubbles and their responsiveness. You just have to add a simple shortcode that you can add by defining the chat parameters. Also, I really liked the fact that it supports the multiple type of conversation styles. So, if you are looking for some tool to display chats then you may try this plugin.